Big changes are taking place in the small town of Elbe, Washington. Railroad pioneer and founder of the Mt. Rainier Scenic Railroad Tom Murray, has handed the baton to industry entrepreneur Al Harper and entertainment expert Wayne Rankin. The Mt. 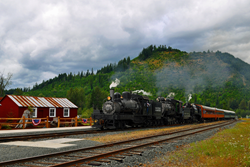 Rainier Scenic Railroad and Museum (MRSR) is now Mt. Rainier Railroad. “Exciting changes are taking place, said Wayne Rankin, President of the new company. Al and Carol Harper, rail transportation experts and owner of two of the nation’s most scenic and historic railroads, bring their expertise to Elbe. Mr. Harper will help rebrand and make immediate and major improvements. With a career that spans 40 years in tourism and development, Harper’s experience is a welcome addition that opens up new opportunities, said Rankin. The MRSR was founded in 1981 as a result of the passion of Tom Murray who helped build one of the most comprehensive collections of steam powered logging locomotives and equipment in North America. A former employee of Disney and Sega-GameWorks, Wayne Rankin, who has served as MRSR’s Executive Director of the past 2 years, is an entertainment and hospitality industry veteran with 30+ years of strategic business and operations experience. Harper spoke of the changes ahead. “Visitors can expect a whole new production. We’re taking what we know works and applying those best practices to operations. We’re doubling the size of payroll and making an immediate investment into the railroad. We’re rebuilding the guest experience from the ground up.” Harper has considerable experience with productions. He and his wife Carol also own Rail Events, a popular series of live events at railroads across the United States and Canada, including the Warner Bros. production Polar Express™. Last year over 7000 visitors flocked to the tiny town of Elbe to ride the Santa Express, but with the addition of Polar Express™ ridership is projected to increase up to 18,000 passengers. The Mt. Rainier Railroad is a steam-powered railway operating in Washington State. The museum is a nonprofit organization operating under the direction of Western Forest Industries Museum. Approximately 60,000 visitors are expected to ride the train to visit the museum. Weekly scheduled departures run May through October with the Polar Express™ excursions scheduled to start in late November and run through the month of December. Passengers travel through the forest and foothills south of Mt. Rainier, over the glacial fed Upper Nisqually River to the museum. For more information visit MtRainierRailroad.com or call 888-STEAM-11.